A Cruise is MORE THAN just Food, Food & More Food! When I mention “cruises” to people who have never cruised, I often hear people say “I don’t want to cruise, all you do is eat!” Let me dispel that myth right now. Cruising is WAAAAYYY more then just food! Just check out the Video above…eating was not high on the list. I have personally been cruising for 18 years. I have sailed many different cruise lines, and yes, I do like a cruise line that has really good food, I mean…we all do have to eat meals! But people are genuinely shocked on their first cruise experience that dining is just a small part of the Cruise Experience. “Why do most people take a cruise?” It isn’t to eat… here are the top reasons why I CRUISE! ADVENTURE – Cruising will take you places that it would normally take you several trips to see. For example, a typical 7 day Caribbean Cruise will take you to 4 different Islands. Very hard to see all of that in one”land” trip. It is great to see which Islands you would love to go back to and spend a week on land…like a scouting mission. And depending on what Cruise Line you are taking, there are many islands that you can go to that would be way to hard to reach via airplane. For example, we took a Windstar Cruise to Isle de Saints in by Guadeloupe. Windstar typically gets into tiny ports that feel “off the grid”. SO MUCH TO DO – So much to keep you busy while at sea! There is something for everyone on a Cruise… Wine tastings, Painting Class, Bocce Ball, Basketball, Surfing, Dancing, Comedy shows, Broadway Shows, Casino Gambling… Geeze, getting tired, but I am not done. Working out, taking classes to learn how to cook, sculpt, trivia contests and fabulously fun sing alongs. (This could be dozens of reasons, but I just grouped them into 1. TOTAL RELAXATION – I can’t think of anything more relaxing then lounging on your own private deck with a good book (who am I kidding…3 pages in and I fall asleep! ), a cappuccino or a glass of wine. And when I want to be pampered I head to the spa for a bit more relaxation. There is no doubt about it, fresh sea air does something to your mind and body that makes you go ” ahhhhhhhhhhhh”. ROMANCE – Sunsets at sea? A starry sky with no light pollution? Need I say more. I love land vacations too. In fact, years of cruising introduced me to Islands that I now return to often. There are wonderful things about both vacations. In fact, I have found excellent finding options at resorts I have stayed at… but to me, I never choose a vacation for food…I choose for Adventure, Relaxation, Romance and OPTIONS! I have been a Cruise Specialist for almost 12 years now and approximately 1/4 of my clients are solo/single travelers. 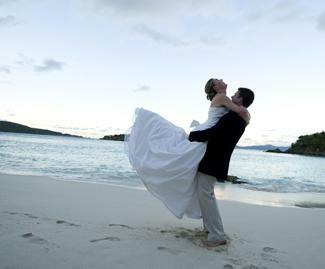 Cruising is a great way for singles to travel. Whether it is with a group or a couple of single friends, after a day on a cruise solo travelers are suddenly “not so solo” anymore! 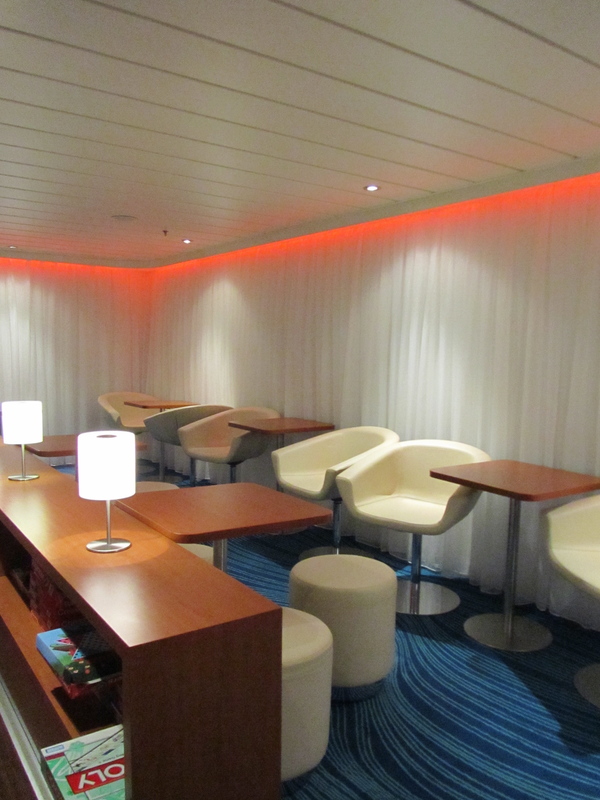 On any given cruise ship there are bound to be quite a few singles…so you won’t be alone! Cruise lines do cater to the singles by hosting “meet & greet” cocktail parties throughout the cruise. For those of you unfamiliar with cruising, the cruise fare is usually quoted in a “per person” rate. That rate is always based on double occupancy. However, if you are planning to have your own stateroom as a solo you are required to pay “double” (except on very few occasions where the cruise line is running specials). For many this seems unfair and sometimes it is a deciding factor in cruising for a single/solo. Although on the surface, it does seem unfair. But if you think about the cost of a cruise in terms of booking a hotel rate, it is really not unfair at all. If you are planning a weekend vacation at a hotel, you are quoted a “per night” rate based on the room you choose. For example, you may choose a hotel accommodation that costs $300 per night. If you are traveling alone it will cost you $300 per night. If you are sharing with a friend and splitting the cost, it would then cost you each $150 per night. The hotel does not charge you half the room price if you are only 1 person in the room. The hotel bases their operating budget on the cost of the room, whether 1 or 2 guests are in the hotel room. A cruise ship is very similar. If a stateroom costs $300 per night, as a solo you would pay $300 per night and if you share the stateroom you would split that. Sounds fair…but why does it seem so unfair? It is the way Cruise pricing is quoted…on a “per person basis.” If a client hears that a cruise is $150 per person/per night, it is hard to understand why as a solo you have to pay double ($300 per night). It somehow sounds wrong for a cruise to charge a 200% cruise fare for a solo traveler. But the reality is that the Stateroom has to be paid for, exactly like the Hotel room. The Cruise lines formulate a budget based on each stateroom being filled whether 1 or 2 guests are in the stateroom. IF the cruise was quoted in a “Per Cabin” rate instead of a “per person” rate, no one would think twice about the solo pricing. Some cite that the difference is that Cruise fares include meals and the solo traveler is only eating for 1, so shouldn’t there be a discount? Yet if you were staying at a hotel that included daily breakfast, you would not get a discount on the Hotel room rate if you are solo. Again, it is thought of in terms of a “Room charge per night”. As a solo cruiser, it might sound unfair to pay double, but when you compare it on equal terms to a hotel vacation, you will still find the Cruise a much better value…even when you are traveling solo! So don’t let that 200% charge for a Solo Cruise fare scare you away…it is just in the way it is phrased. And let’s not forget the benefits of having your own room – privacy, space and your own closet! 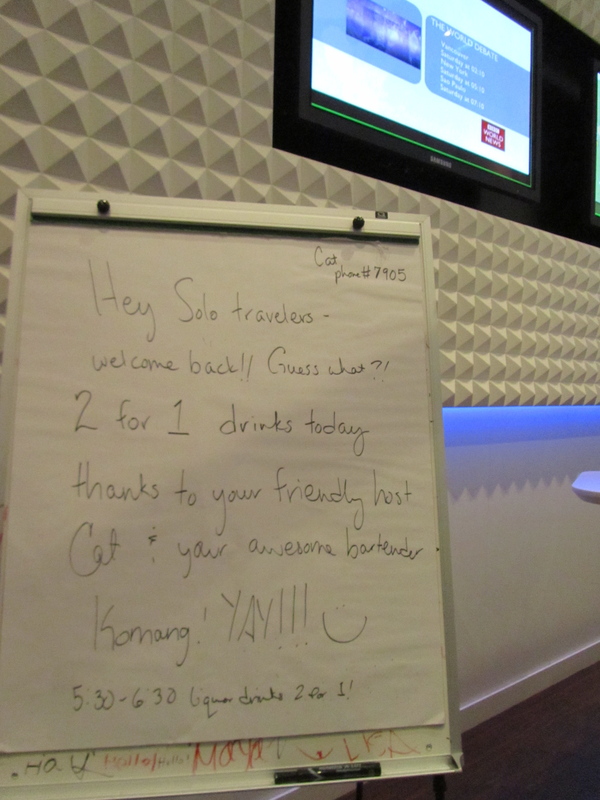 Plan your solo travel today! All I ever needed to know … Girlfriend Cruise Edition! Guest post from Girlfriendology.com – Great source for all things “Friends”! Wish you could have joined us on our Girlfriend Cruise to Bermuda with GirlsonaCruise.com! It was an amazing seven days with fabulous female friends – new and not so new. We sailed to beautiful Bermuda on board the Celebrity Summit. We met wonderful women from all over the U.S. who ‘get’ them importance of getting away with their girlfriends! Day 4 of Girlfriend Cruise – We’re here in Bermuda! 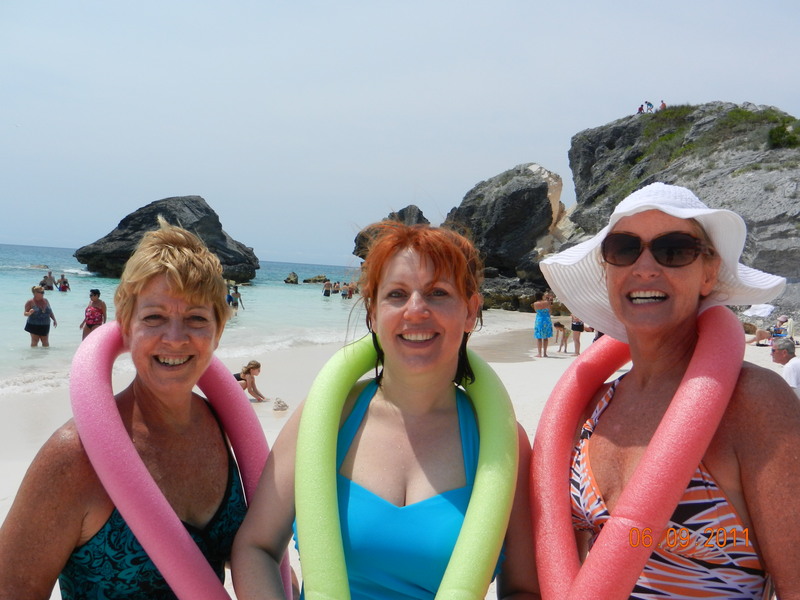 THE Girlfriend Cruise to Bermuda – Smoothing Sailing with Fab Female Friends! Sometimes you just gotta hang out with your girlfriends! Kids, husbands, relationships, jobs, responsibilities and schedules were all left back in the U.S. when we debarked for Bermuda – and it was a very good thing. Quality time with girlfriends, I personally find, and witnessed other women who agree, was an amazing opportunity to ‘get back to our true selves.’ It’s wonderful how the laughter, conversations, smiles and overall happiness just take over your whole outlook on life. We definitely experienced some great ‘girlfriend therapy’ just by spending a little quality time with other women. Girlfriends NEED each other. Two of the women in our group are cancer survivors (who met on a cancer survivor cruise previously). They expressed deep appreciation and even the medicinal value of spending time with their girlfriends. We women don’t just enjoy time with our friends, we NEED them. We need their friendship, support and guidance. Thankfully we’re there for each other. It’s wonderful to feel totally accepted. I’ll be honest with you. I don’t think I’ve been in public in a bathing suit in a decade (seriously!). It was wonderful to feel so totally accepted and comfortable with a group of girlfriends that it didn’t matter if I held in my stomach or had the cutest suit. We just enjoyed each other’s company – as we are. Laughing together is medicinal. The conversations we had, funny secrets we shared, stores we told – all bonded us through our life experiences and lessons. There is nothing like laughing with female friends with whom you feel so comfortable and happy. Laughing, and friendship, is VERY good. Size of Nowhere – as vast as the Ocean is wide! 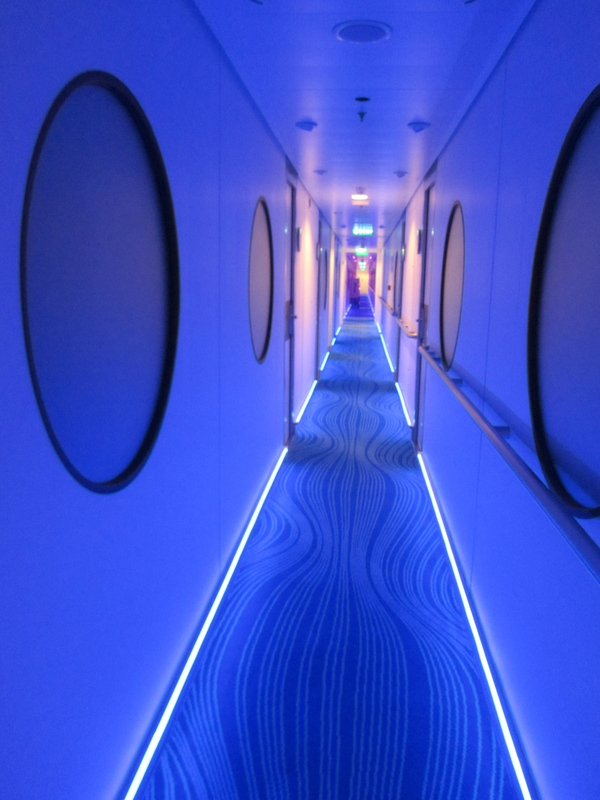 Population – Very Exclusive, only other passengers on your Cruise can visit! Even if you have never been on a “Cruise to Nowhere”…as long as you have been on a cruise, you have experienced “Nowhere”. Although it is actually “Somewhere”…it is definitely “Nowhere”. I am on the plane flying back from my cruise to “Nowhere” onboard Royal Caribbean’s Allure of the Seas. Yes, the ship went exactly there…NOWHERE! And it was great! First let me say, I was on the “Creme de la Creme” of Cruise Ships as far as the facilities, activities & events on a Cruise Ship. At 220,000 gross tons, the Allure of the Seas is best described as a floating City. It is great that the Allure takes you to exotic ports of call…but my favorite port of call for the Allure is “Nowhere”. NO pressure to hop off the ship, “Nowhere” is actually ON the Ship! Fresh Ocean air…restorative benefits for your health! Breathe!!!!! Great chance to hit the Spa and get a 2 hour massage. If you are on a Family Reunion Cruise or Cruising with a group, it gives you the time to really spend together. I can actually finish that book I have been reading, in a quiet spot on the ship. Great time for educational enrichment or even Company Seminars! I can just close my eyes, feel the breeze and feel the moment. Some on my favorite moments on a Cruise are when we are in between ports and have absolutely no pressure and nothing to do except what YOU want to do! In fact, one big advantage of a Cruise Vacation over a land vacation is the endless options of activities. Should you have the dreaded rainy day, on a Cruise you are never bored! On a Cruise ship the size of the Allure, if you can’t find something to entertain you (or relax you) then we seriously need to call the “I CAN’T HAVE FUN POLICE”! Or maybe even the “PERSONALITY POLICE!” Even the most miserable of people will find something to smile about! No matter what type of person you are, there is something for you…..
Sun worshipers?.. the deck is your spot! Gamblers? …the Casino is open! Active?…Golf, Rock Climbing, Bball, Spin Class, Ice Skating & even a Zip Line! Crafty?…Try one of the many creative workshops offered. Music Buffs?…Orchestras, bands & DJs ready to “Rock your Socks” off! Self Indugent?…let Vitality Spa pamper you to “wet noodle” status! Of course even on a small Cruise ship like the Windstar, Sea Dream that doesn’t have all the bells & whistles of a mega ship…a day at Sea is what a Cruise is all about ….relaxation. The gentle breeze, the mesmerizing swaying of the ocean…it is thought provoking, stimulating & pampering. Yes, I love “Nowhere”. It is exactly the “somewhere” I love to be! Does the TSA really want to “Touch His Junk”?! Where was John Tyner when he said “If you touch my junk, I will have you arrested”! B. – At the Jones’ yard sale in my neighborhood. C. – At the Airports’ TSA security line. If you guessed “C” then you guessed right (and that means you aren’t living under a rock!). OMG! This is all I have heard about today! Like this is something new? Just last month my husband got the “Pat Down” at the Airport & I have seen hundreds of other people experience this…yet today, this is the hottest news to talk about?! I thought this was old news! This John Tyner was at the Airport, going through TSA security checkpoints and he refused to go through the new body scanner that they are using. As protocol has it, if you refuse to go through the scanner, your option is to get a “pat down” (as seen on cop shows since the Dragnet days!). Well, this John Tyner wasn’t happy about that! So as the TSA agent was giving an explanation of how he would be “Patting him down” he said “If you touch my junk I will have you arrested”. The TSA Agent informed him that he needed to call a supervisor since he made that statement (OF COURSE! that statements says “I am going to sue you and have your job”, so he had to protect himself!). I fly often and have been very inconvenienced at the TSA security. I too have bitched & moaned about the time delay (it’s just human nature to complain). And through it all…I am so happy that they are there doing their jobs. I gladly take my shoes, belt, sweater & bracelets off. I gladly pull out my laptop, ziploc filled with liquid items & electronics. I gladly step aside to be searched more thoroughly when it is requested of me. I actually get excited, because to me it means that they are doing their jobs! They are not there to get their “Jollys”. TSA is there to protect the people, the planes & America from another tragedy. I say “Thank You” and I gladly oblige. The day I stop believing this, is the day I stop flying. So I would agree to be patted down. I have nothing to hide. I sacrifice a little inconvenience for the safety of all. I am getting on a plane with many other people, and that is a privilege, not a right. And everyone else on that plane deserves to have the comfort that I am not hiding anything. I personally don’t want to get on a plane & worry about someone having circumvented TSA! John Tyner needs to get over himself and start thinking about the collective good for Airline travel and that is preventing terrorists from attacking us again! Does he really think that TSA agent wanted to touch his junk?! I remember when everyone was freaking out that their pocketbooks and carry-ons were being scanned. I remember when everyone was freaking out about having to take off their shoes! I remember when people were freaking out about not bringing liquid or sharp instruments through security…and now this is the new thing. TSA security keeps evolving & changing due to threats and concerns that we (the general public are not even aware of. As Americans, we need to kinda “go with the flow” as it is a learning process for all of us, and totally for our own good! Sure, could the process be improved? Yes. Is it flawless? No. Are there always a few bad eggs in ANY job place, that abuse authority and should be fired? YES. But I believe that the TSA is doing the best they can to keep America & Americans safe. 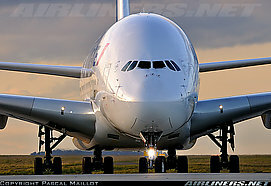 It is simple to me…If you want to fly, you have to follow the rules…or don’t get on my plane!